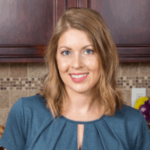 Published: Nov 2, 2017 · Modified: Apr 11, 2019 · By Jen Sobjack · This post may contain affiliate links. 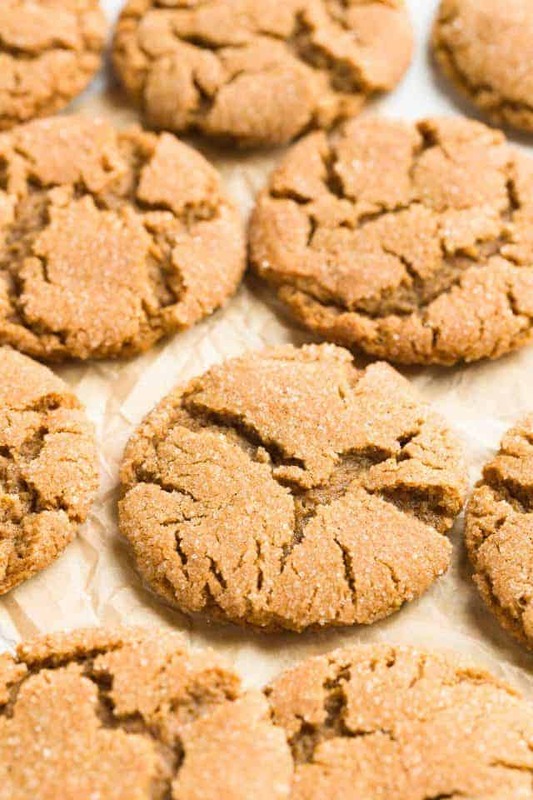 Soft and Chewy Gingersnap Cookies infused with molasses, cinnamon, and cloves. These will make the perfect edible gift this holiday! 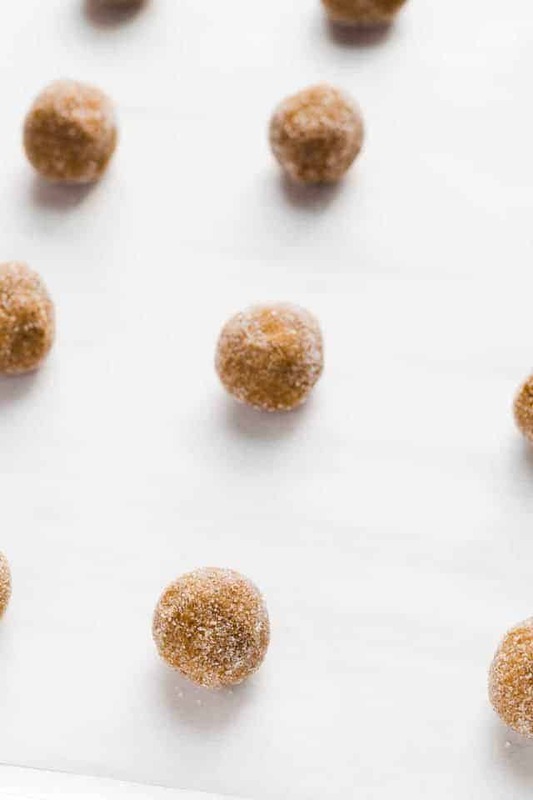 Gingersnaps are one of my favorite cookies to make around the holidays. Every year I whip up a batch and ship them off to family. You really can’t go wrong with a ginger cookie. Like with these salted caramel ginger macarons and double ginger molasses cookies, they’re so good! Growing up I would look forward to my godmother’s old-fashioned gingersnap cookies. They were the absolute best! She would bake them every year for the holidays. Sometimes she’d wait for me to visit and we’d make them together. I always enjoyed spending time in the kitchen with her. I’ve made her recipe countless times over the years and it never fails to bring back sweet childhood memories. 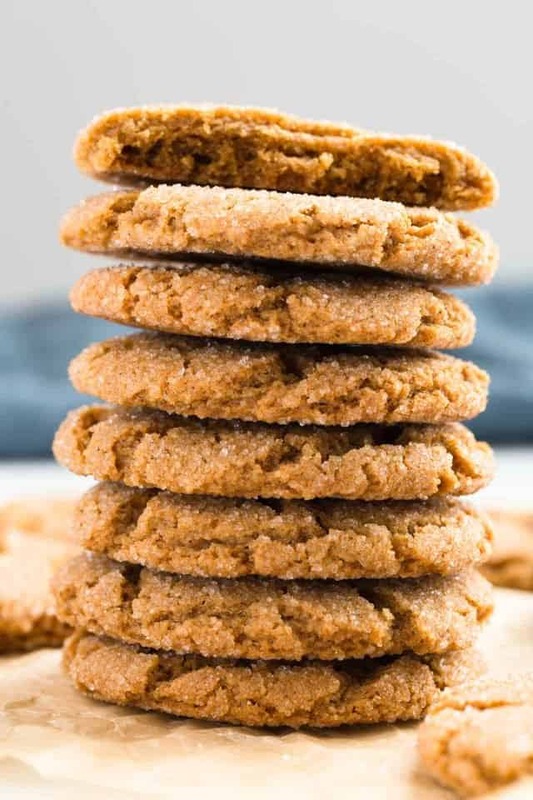 The soft chewy texture is exactly what I love most when it comes to cookies and these chewy gingersnaps are exactly that. They are flavored with molasses, cinnamon, ginger, cloves, and brown sugar. The spices are perfectly balanced. 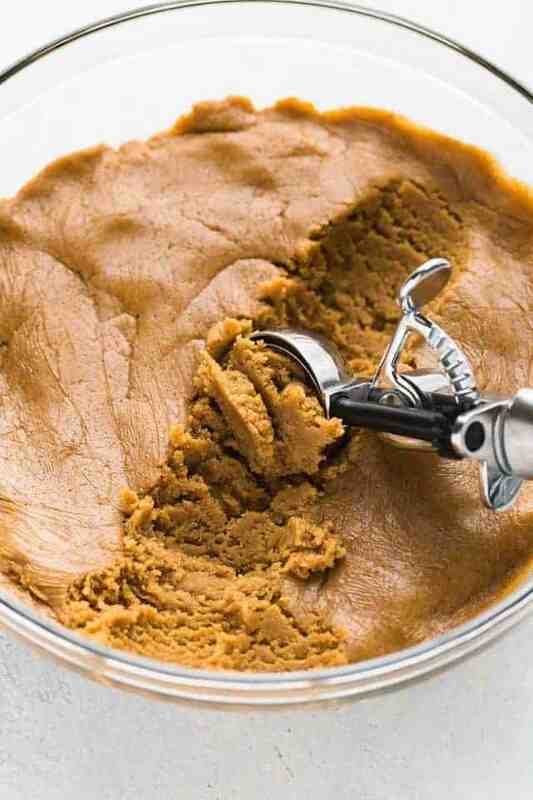 There are a couple factors that aid the chewy texture of today’s cookies. A combination of white and brown sugar is used and we all know brown sugar is amazing for creating a chewy texture. It also adds more molasses flavor which is a bonus. The white sugar isn’t moist like brown sugar so adding some of that helps create a crispness on the outside of the cookie. Molasses is also a culprit in the chewy factor. I used 1/4 of a cup which is just enough liquid to make the cookies spread a bit. Shortening! My beloved shortening. I am known for adding shortening to my cookie recipes to help keep them soft. However, it works a bit differently in today’s cookies. Yes, they are still soft in the center but the shortening works with molasses to create chewiness. I roll my gingersnaps in granulated sugar before baking. This will add to the crispiness of the exterior but does nothing for the soft, chewy center. I’m all for contrasting textures but you can skip the sugar rolling if you want. Or you can roll them in coarse sugar for more of a crunch! The great thing about these cookies is they retain their chewy texture for several days so they perfect for giving away as holiday gifts. 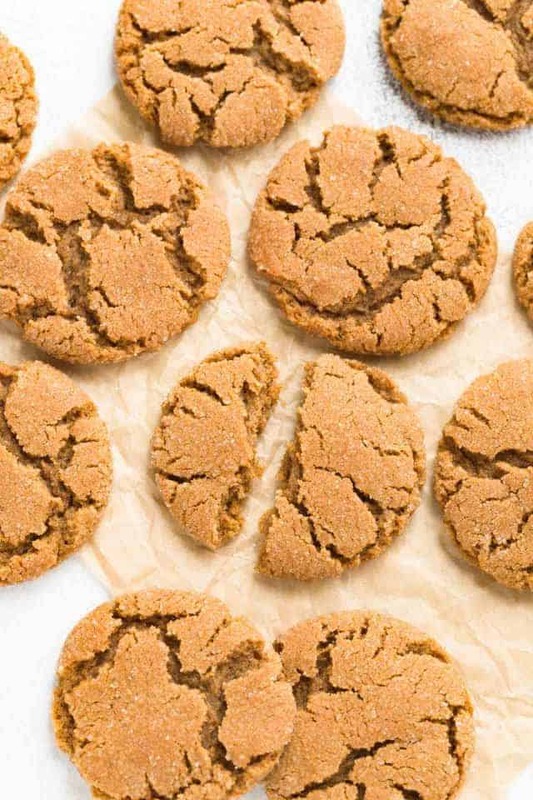 The outer appearance of today’s chewy gingersnap cookies reminds me a lot of crackle cookies. The cracking happens during baking. The cookies will puff up then begin to spread which results in a crackly top. I’ll never stop making these chewy gingersnap cookies loaded with ginger, cinnamon, and molasses. They’ll remain close to my heart. In a large mixing bowl, beat together the shortening and sugars until fluffy and blended. Beat in the egg and molasses. In a separate bowl, combine all of the dry ingredients. Stir with a whisk. Slowly stir the dry mixture into the molasses mixture just until dough forms. Cover and chill the dough for at least 2 hours. Preheat the oven to 375ºF degrees. 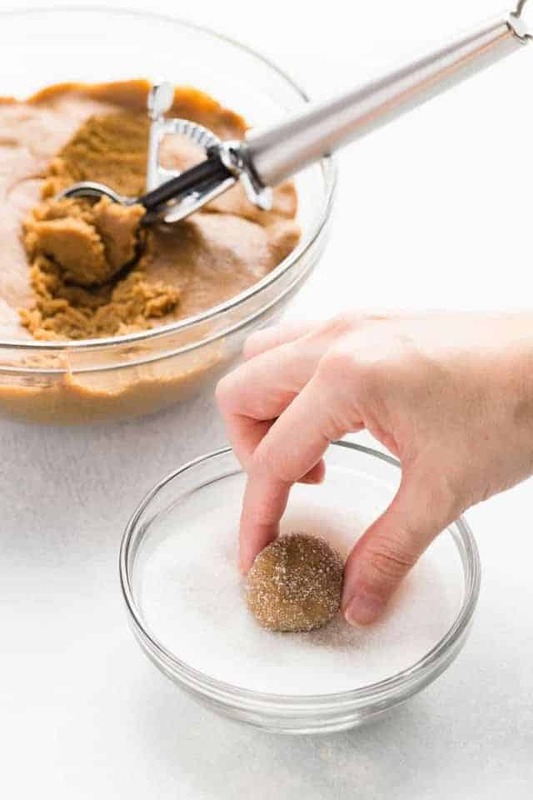 Roll the dough into 1 Tbs sized balls, rolls the balls into the remaining sugar, and place them 2 inches apart on a parchment-lined baking sheet. Bake 9-11 minutes. Cool the cookies on the pan for 5 minutes before transferring to a wire rack to cool completely. The cookies will remain fresh for 1 week stored in an airtight container at room temperature. The cookie dough can be made up to 3 days in advance. Cover tightly and store in the refrigerator. Bring to room temperature and continue the recipe instructions. Baked cookies can be frozen for up to 3 months. Cookie dough can be rolled into balls and frozen for up to 3 months. Roll frozen dough balls in sugar and bake as directed. You may need to add an additional minute or two to the bake time. Delicious! Just like I remember my Grammas…maybe even better! Nice crunch on the outside with a soft chewy inside. Hard to stop at just one. Thanks, Debi! I’m thrilled that you enjoyed the cookies so much! These were super easy and here is the trick for soft and chewy. Balls, those cookies I left as round balls were just as pictured and promised, cracks, chewy,soft and delish. When I pressed them down even, even a little bit you get a hard version, still taste good but requires milk or hot drink IMO. Thank you for a simple and tasty cookie. Thanks for making the cookies and sharing your feedback! Happy to hear they came out great! ok so I actually made these with earthbalance coconut spread instead and it was delicious. thanks! Hi, i want to make these tomorrow for christmas. Can you sub lard for vegetable shortening? I have the brand ‘armour’. I’ve never used lard so I’m unsure how it will turn out. I found these cookies during my breast cancer chemo treatments. I am making my 2nd batch right now as I have chemo tomorrow. My first batch turned out perfect and only lasted one day they were so delicious. They settle my stomach and help with the nausea. Thank you for sharing the recipe. It’s helping me survive this brutal disease and treatment. Do you have to roll them in sugar? I am putting white chocolate on top and I don’t want the extra sugar on top. Nope, you can skip it. Before refrigerating the dough for 2 hours, what should the texture of the dough be? mine seems a little too soft. Maybe after the refridgeration? I don’t want to add more flour and then have them not turn out!! It will a little soft but will firm up in the refrigerator. There is a video above the recipe card showing how to make them and you can see the texture of the dough. My cookies ended up being little mounds instead of flat circles. I followed the directions and the cookies are fully cooked. Not sure why they look so different than yours. It’s quite possible you used too much flour. Make sure you are not scooping the flour out with the measuring cup. Instead, lightly spoon it into the measuring cup then level it off with a knife or weigh the flour. Thank you! Man ive been measuring flour wrong this whole time!! I can guarantee the butter the butter is the reason they spread. Shortening doesn’t spread so it’s best to follow the recipe exactly. Your unsulfered molasses link goes to an Amazon item called “blackstrap” molasses, so that’s what I picked up at the grocery store. The cookies didn’t spread and were burned on the bottom, and they tasted bitter and generally unpleasant. I then read that this is the exact result you get when using blackstrap molasses. I just made these and they’re addictive! So yummy and chewy. I need to triple the recipe so I get a few this time! That’s fabulous! Glad you enjoyed the recipe!! These look GREAT, but can butter be substituted for the shortening? ( I don’t use shortening ). How will that affect the cookies? Shortening helps to keep the cookies from spreading too much. Using all butter in this recipe may slightly alter the texture of the cookie. Have been making these for 3 months now. I add ginger paste and chopped ginger to the sugar butter mixture.. Love these…..
I’m so happy you love the recipe. I love the idea of adding ginger paste and chopped ginger. I’ll have to try it!! I have made this recipe several times and it’s never failed me, but I made them for a work potluck and they were an absolute HIT so I had to let you know! Thank you so much for sharing that! So happy they were such a success!! I want to try this recipe. Is there any alternative of vegetable shortening? For the best results, shortening is needed for this recipe. You could try using butter but the texture and spread will not be the same. Would you use butter flavored shorting? Or just regular? Personally, I would not use butter flavored shortening. Golden shortening is vegetable shortening. The only difference is the golden shortening has the addition of artificial butter flavor. If you want your cookies to taste like artificial butter flavor, then yes you can use golden shortening. These cookies are delicious. They look just like your picture too. I am so happy with these. This recipe will be a yearly Christmas tradition for me. Thank you! Can I sub shortening for something else? You can use softened butter but the texture of the cookie will not be the same and they may spread quite a bit. These are hands down my favorite cookies. I first tried them at a cookie exchange. Once I found out a good friend of mine brought them she was kind enough to make another batch for my family and I. I’m not a cookie fan or sweets in general, but I could eat these all day. Thank you so much for sharing this wonderful recipe. Thank you so much for the kind words, Kaila! Look delicious!What can I use instead of molasses? Honey, maple syrup, dark corn syrup will all work fine in place of molasses. Keep in mind, not using the molasses will affect the flavor of the cookies. So I just made a batch of these cookies, and WOW they are as good as advertised. Thank you for sharing the recipe. My family ate the whole batch, in fact they were gone well before the chocolate chip cookies and that is rarity in my family. Wonderful, John! I’m so glad to hear you and your family enjoyed the recipe! I baked a batch of these last night as a trial run. I chose them for my cookie exchange at work. They are amazing! I ate some for breakfast this morning hahaha. They look perfect and taste even better! I will be tripling the batch and packaging them up for my coworkers on Sunday. Thank you for this awesome recipie! 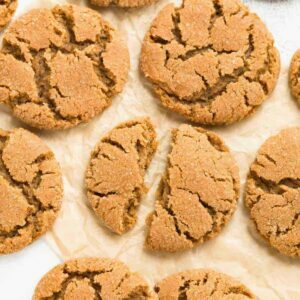 I love soft and chewy gingersnap cookies! Yours look so delicious and perfect! I could eat a dozen! It would be so easy to eat them all before you even realize it. These are seriously one of my FAVORITE holiday cookies! Love gingersnaps! Thanks, Amber! Ginger snaps are simply the best. Gingersnap cookies are one of my favorite holiday flavors! I love that these are chewy and so full of flavor. They look perfect, too! Thank you for the compliments, Gayle! the cookies look wonderful Jen! and you are inspiring me to try shortening now..I never bake with shortening either..I once had a cake frosted with buttercream made entirely of shortening and I hated it..It was so bad..since then I am scared to even touch shortening…maybe I need to give it a try! Eeeeewwww! Buttercream made with shortening!? That sounds terrible. I wouldn’t want to cook with either after that experience. I hope you change your mind and try shortening in cookies. It’s also good for pie crusts and biscuits. Ginger snap cookies are such a classic cookie that works well with many flavors. These look delicious. I love gingersnaps. Now I have a total crave going on! I think I’ll do a little baking tommorow! Thanks, I love your blog. Fantastic recipes. You are too sweet, Janelle. Thank you for the kind compliments!